René Descartes (1596 - 1650) was a French philosopher, mathematician, scientist and writer of the Age of Reason. He has been called the "Father of Modern Philosophy", and much of subsequent Western philosophy can be seen as a response to his writings. He is responsible for one of the best-known quotations in philosophy: "Cogito, ergo sum" ("I think, therefore I am"). Descartes (pronounced day-CART) was born in the town of La Haye en Touraine (since renamed Descartes) in the Loire Valley in central France on 31 March 1596. His father, Joachim Descartes, was a busy lawyer and magistrate in the High Court of Justice, and his mother, Jeanne (née Brochard), died of tuberculosis when René was just one year old. René and his brother and sister, Pierre and Jeanne, were therefore mainly raised by their grandmother. From 1604 until 1612, he attended the Jesuit Collège Royal Henry-Le-Grand at La Flèche, Anjou, studying classics, logic and traditional Aristotelianism philosophy. His health was poor and he was granted permission to remain in bed until 11 o'clock in the morning, a custom he maintained for the rest of his life. He then spent some time in Paris studying mathematics, before studying law at the University of Poitiers, in accordance with his father's wishes that he should become a lawyer, obtaining his law degree in 1616. However, he then abandoned his education and spent several years traveling and experiencing the world (he later claimed that his formal education provided little of substance). It was during this time (in 1618) that he met the Dutch philosopher and scientist Isaac Beeckman (1588 - 1637) while walking through Breda in Holland, who sparked his interest in mathematics and the new physics. In 1622, he returned to France, and soon afterward sold all his property at La Haye, investing the proceeds in bonds which provided him with a comfortable income for the rest of his life. He returned to settle in Holland in 1628. The next year, he joined the University of Franeker; the year after that, Leiden University; and, in 1635, he is recorded as attending Utrecht University. He had a daughter, Francine, after a relationship in Amsterdam with a servant girl, Helène Jans, although Francine died at the age of five. In fact, in the years between 1628 and 1649, he lived at 14 separate addresses in 10 different Dutch cities. It was during this 20 year period of frequent moves that he wrote almost all of his major works on philosophy, mathematics and science. He shrewdly held off publication of his first work, "Le Monde" ("The World"), written between 1629 and 1633, due to the condemnation of the works of Galileo Galilei (1564 - 1642) and Nicolaus Copernicus (1473 - 1543) by the Roman Catholic Church in 1633. The most famous of his works include: the "Discours de la méthode pour bien conduire sa Raison et chercher la Vérité dans les Sciences" ("Discourse on the Method") of 1637, his first rationalist vision of the progress of human knowledge; the "Meditationes de Prima Philosophia" ("Meditations on First Philosophy") of 1641, a more formal exposition of his central tenets, in Latin; and the "Principia Philosophiae" ("Principles of Philosophy") of 1644, an even more systematic and comprehensive exposition of his views. For a time, in 1643, Cartesian philosophy was condemned by the University of Utrecht. Descartes died of pneumonia on 11 February 1650 in Stockholm, Sweden, where he had been invited as a teacher for Queen Christina of Sweden. Later, his remains were taken to France and buried in the church of Sainte-Geneviève-du-Mont in Paris, and then, during the French Revolution, disinterred for burial in the Panthéon among the other great thinkers of France. Currently, his tomb is in the church of Saint-Germain-des-Prés in Paris, and his brain is in the Musée de l'Homme. Descartes lived during a very skeptical period, at a time before science as we know it existed, and after a long period of relative stagnation in philosophical thought during the Church-dominated and Aristotle-influenced late Middle Ages. He had been impressed, in both his academic work and in his experience of the world at large, by the realization that there appeared to be no certain way of acquiring knowledge, and he saw his main task as the epistemological one of establishing what might be certain knowledge as a stepping stone towards the ultimate pursuit of truth. His more immediate aim in this was to put scientific inquiry in a position where it was no longer subject to attack by Skeptics, and he tried to do this by a kind of pre-emptive Skepticism, essentially by being more skeptical than the Skeptics. At the heart of Descartes' philosophical method was his refusal to accept the authority of previous philosophers, and even of the evidence of his own senses, and to trust only that which was clearly and distinctly seen to be beyond any doubt (a process often referred to as methodological skepticism or Cartesian doubt or hyperbolic doubt). Only then did he allow himself to reconstruct knowledge (piece by piece, such that at no stage was the possibility of doubt allowed to creep back in) in order to acquire a firm foundation for genuine knowledge and to dispel any Skepticism. Using this process, which he detailed in his epochal "Discourse on the Method" of 1637 and expanded in the "Meditations on First Philosophy" of 1641, Descartes attempted to narrow down, by what is sometimes called the method of doubt, what was certain and what contained even a shadow of a doubt. For example, he realized that he could doubt even something as apparently fundamental as whether he had a body (it could be that he was just dreaming of it or that it was an illusion created by an evil demon), but he could not, under any circumstances, doubt whether he had a mind or that he could think. He followed this up with a pure, abstract thought experiment. He imagined an evil spirit (or "deceiving demon") whose sole intention was to mislead him, and asked whether there was anything about which the demon would not be able to mislead him. His conclusion was the act of thinking, that the demon could never make him believe that he was thinking when he was not (because, after all, even a false thought is still a thought). Having identified this single indubitable principle, that thought exists, he then argued that, if someone was wondering whether or not he existed, then the very act of thinking was, in and of itself, proof that he did in fact exist: the famous "Je pense, donc je suis" ("I think, therefore I am") - the similar statement in Latin, "Cogito ergo sum" is found in his later "Principles of Philosophy". It is worth mentioning here that, by "thinking", Descartes did not just mean conceptual thought, but all forms of consciousness, experience, feelings, etc. Having dispelled all doubt by this process, Descartes then worked to build up, or reconstitute, the world again. But he was careful not to do this willy-nilly, but only according to his own very strict rules, so that the "reconstituted world" was not the same as the original one which he had dismantled piece by piece due to doubts. The way he achieved this (which, it must be said, appears from a modern viewpoint like something of a conjuring trick) was to argue that among the contents of our (certain) consciousness was the idea of God, which in itself he saw as proof of the existence of God. He then argued that, if we have the overwhelming impression of the existence of a concrete world around us, as we do, then an omnipotent, omniscient and omnibenevolent God would ensure that such a world does in fact exist for us. Furthermore, he asserted that the essence of this physical world was extension (that it takes up space), contrary to the extensionless world of the mind. Paradoxically, this was an essential step forward in 17th Century science as it established a physical world which was of a mathematical character and permitted mathematical physics to be used to explain it. Also important is that, as we have seen, although God was indispensable to Descartes' method of arriving at a physical world, once such a world was accepted, it was no longer necessary to involve God in the description and measurement and explanation of how things work. Thus, the process of science was freed from theological constraints and interference. Descartes dismissed the senses and perception as unreliable, and to demonstrate this he used the so-called Wax Argument. This revolves around the idea that a wax object, which has certain properties of size, color, smell, temperature, etc, appears to change almost all of these properties when it is melted, to the extent that it appears to our senses to be a completely different thing. However, we know that it is in fact still the same piece of wax. Descartes concluded from this that the senses can be misleading and that reason and deduction is the only reliable method of attaining knowledge, which is the essence of Rationalism. Descartes was the first to formulate the mind-body problem in the form in which it exists today (see the section on Philosophy of Mind), and the first to clearly identify the mind with consciousness and self-awareness, and to distinguish this from the brain, which was the physical seat of intelligence (Dualism). In his epistemological work in the "Discourse on the Method", he had realized that, although he could doubt that he possessed a body, he could not under any circumstances doubt that he possessed a mind, which led him to conclude that the mind and the body were two very different and separate things. His particular form of Dualism (known as Cartesian Dualism) proposed that the mind controls the body, but that the body also influences the otherwise rational mind (such as when people act out of passion) in a kind of two-way interaction, which he claimed, without much evidence, occurred in the pineal gland. Gilbert Ryle later described this kind of Dualism (where mental activity carries on in parallel to physical action, but where their means of interaction are unknown or, at best, speculative) as the "ghost in the machine". Although his own solution was far from convincing, this kind of Cartesian Dualism set the agenda for philosophical discussion of the mind-body problem for many years after Descartes' death. It should be noted, however, that for all Descartes' innovation and boldness, he does not abandon the traditional idea of God. He defined "substance" (essentially meaning what the world really consists of) as "that which requires nothing other than itself in order to exist", but he concluded that the only true substance was God himself, because everything else (from souls to material objects like the human body) was dependent on God for its existence. 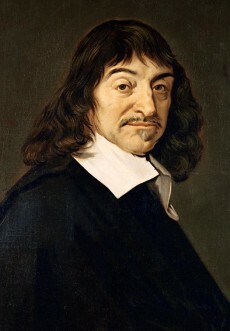 He used his own variations of the causal argument, the ontological argument and the cosmological argument for the existence of God in his "Meditations" (see the section on Philosophy of Religion), and the existence of God played a major role in his validation of reason and in other parts of Descartes’ system. Given the important rôle God plays in his work, suggestions that Descartes was really a closet atheist, and that he includes the arguments for the existence of God as window dressing, appear extremely unlikely. In mathematics, Descartes realized that a graph could be drawn to show a geometrical interpretation of a mathematical function using points known as Cartesian coordinates, and thereby founded analytic geometry or Cartesian geometry (using algebra to describe geometry), which was crucial to the subsequent development of calculus by Sir Isaac Newton (1643 - 1727) and Gottfried Leibniz. He also invented the notation which uses superscripts to indicate powers or exponents, and his rule of signs is also a commonly used method to determine the number of positive and negative zeros of a polynomial. It can be argued that his reflections on mind and mechanism, impelled by the invention of the electronic computer and by the possibility of machine intelligence, blossomed into the Turing test of a machine's capability to demonstrate intelligence. In optics, he showed by using geometric construction and the law of refraction (also known as Descartes' law) that the angular radius of a rainbow is 42 degrees. He also independently discovered the law of reflection (that the angle of incidence equals the angle of reflection). In physics, Descartes introduced (before Newton) the concept of momentum of a moving body (what he termed the "amount of motion"), which he defined as the product of the mass of the body and its velocity or speed. His three "laws of nature" became the basis of Newton's later laws of motion and the modern theory of dynamics: that each thing tries to remain in the same state and, once moved, continues to move; that all movement is along straight lines; and that when a body comes into contact with another body the combined "quantity of motion" remain the same (his conservation of motion principle). In an attempt to explain the orbits of planets, Descartes also constructed his vortex theory which would become the most popular theory of planetary motion of the late 17th Century (although subsequently discredited). However, he continued to cling to the traditional mechanical philosophy of the 17th Century, which held that everything physical in the universe to be made of tiny "corpuscles" of matter (although, unlike Atomism, the theory maintained that there could be no vacuum, just a mass of swirling matter).